Presenting the 2016 NANFA Calendar. This Calendar wouldn't be possible without the help, assistance, and giving of multiple NANFA members. 1st, Matt Kneply, who contacted the members and got all the photos compiled, made the layout, and conducted all the business with the printing company. Also, his continuing work on shipping these to you. Without him, there is no calendar. 2nd, There are many NANFA members who contributed their own photos to NANFA for this project. I'm afraid of missing somebody, so we just want to thank all of you who sacrificed and gave up their property to support NANFA. NANFA is excited to have such great artists as members, we value the work you do. 3rd, The behind the scenes people who always assist in these projects; Michael Wolfe and Tom Watson, and the BoD, Thank you. This looks wonderful. I've been trying to become more organized, and I just got my first calender for the fish room. I can't wait to add another! The calendar looks great! Thanks for all your work on this Matt and Josh! Fantastic job, all. I dig all the smaller pictures used on days of the week. A cool feature. I'm sure that very few calendars will go to waste after 2016 comes to an end. I foresee old calendars being cut up and then the large prints being taped up on the walls in everyone's fishrooms. Awesome. Great job. Purchased one for work and one for home. Now I have to wait 9 months to use it! Just ordered mine. Will be a nice addition to the fishroom! These look very impressive. Thanks Matt and to all those who assisted. I will order one now and be thinking of whom would appreciate one as a Christmas gift. Make a wish and look under your Fishmas Tree. And stay off that naughty list too! 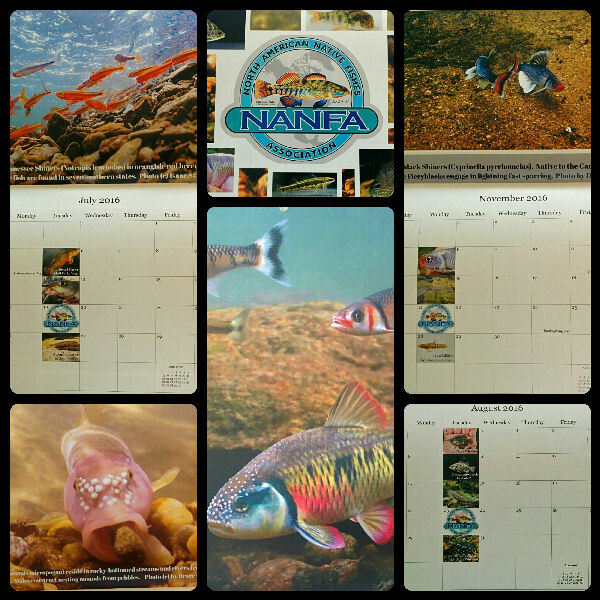 I figure just about every NANFA member is gonna get a 2016 calendar. I'm thinking of those non fish types, family and friends, who would enjoy one. A couple come to mind pretty quick. My Mother-in-Law, not so quick. That's actually a good idea. The look on the mother-in-law's face would be worth the price of 2 of the calendars. I am flattered by, and thankful for, everybody's kind words. Josh is too modest, as he did the b.o.d. work, crunched numbers with me, identified the printer we wound up using, made me aware of some good business practices to follow, and was willing to go above and beyond to get these things shipped as soon as possible. Thanks indeed to Tom, Michael, and all b.o.d.! Thanks to all who submitted photos, you made this a fun job; both in the quality of your work and your willingness to share. Lastly, thanks to Fritz for taking time to double check id's for me. Any errors that are present are mine; anything that is right is due in part to you all! Finally, I have begun shipping orders. I shall try to get your calendars to you as soon as possible. I'm emailing you when I ship them so you can be expecting them. If you place an order and don't hear from me in a couple days, pm me or email me so we can make sure everything is accounted for! If I have already shipped you one, please let me know it has arrived. Got my calendar today! Love it!!! Got mine too. Excellent work guys! Early last week I ordered the calender and some decals (and renewed membership). I got the decals by the end of the week but not the calender. any way to check if it shipped? Its my fault, I took all the inventory to the convention and only returned them to Matt K on Friday. So I am sure that he is mailing your calendar soon. I vote for that shot of Casper laying face down on the road in OK as the cover of the next one. Your calendar will go out Monday, Josh. Sorry about the delay; you ordered the day after I gave them to Michael. Nobody's fault, really, just unlucky timing. That, and it's a combined four hours of driving for me and Michael to meet up, so we weren't able to coordinate schedules until Friday. I'm saving that for the Men of NANFA beefcake calendar we're going to do. "I'm saving that for the Men of NANFA beefcake calendar we're going to do." Are you volunteering or nominating?